With a name like Eagleheart you could probably take a pretty confident stab in the dark as to what sort of music this Czech outfit play, and you’d be right; sort of. While there are no prizes for guessing this is a melodic power metal CD, Eagleheart aren’t the Stratovarius clone you might expect. While they no doubt take some influence from the Finns – particularly in their noodling neoclassical solos – their overall sound is much more o-f a melting pot of various ideas, drawing inspiration from a variety of sources but in the end not sounding like a direct copy of anyone. In this respect they share some ground with mid-tier German outfits like Custard, producing a sound that is immediately familiar but at the same time quite difficult to put your finger on. 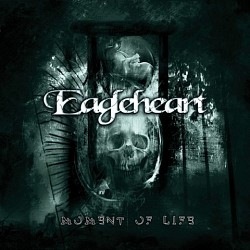 ‘Moment of life’ isn’t really the sort of CD to name standout tracks from, as it works more as a singular body of work, a very professional and solid power metal experience with some mild progressive touches along the way. That said, there are a few songs that do raise their head above the battlements a little – the chorus to “Into the sky” is the pick of the bunch, boasting a particularly captivating melody that sadly isn’t matched by most of the other songs. The closing “Life goes fast” is another impressive effort, probably the most progressive of the lot as it changes tempo at the drop of a hat a couple of times and fits a few different moods into its 7 1/2 minutes. And for anyone disappointed that the band’s name isn’t a more telling indication of their sound, the instrumental “Out of the time” may as well have the prefix “Strato-” as it sounds very much like one of Timo Tolkki’s shred voyages and the guitarists give a great account of themselves. “Don’t turn your head” may be the best song overall though, sounding quite similar to Edguy’s “Vain glory opera” (minus the keyboards), and thus featuring a suitably anthemic chorus and a simple, highly effective driving rhythm. Part of the reason the songs sometimes don’t full distinguish themselves may be the vocals of Vojta Simonik – technically he is more than capable, but he doesn’t really imbue as much bombast as you would hope for into some of the choruses and doesn’t have the sort of voice you could immediately pick out from the rank and file of European power metal singers. Not all the blame can be laid at Simonik’s door though, as the band are ultimately dealing in a style of music that has been thoroughly explored a thousand times over and has a veritable army of bands competing for the attention of the bombarded listeners, so a few songs that have difficulty making a name for themselves is a forgivable offence. Disregarding these quibbles though, the CD is one that is very easy to like as it has a great deal going in its favour. It’s not exactly specialist stuff, but people who aren’t deep into their power metal may find themselves skimming over this one – for enthusiasts on the other hand, it should prove to be a hidden gem. I don't know if I've ever heard a band that sounded so close to early Edguy that wasn't early Edguy themselves, but here it is anyway. Eagleheart are a Power Metal band from the Czech Republic, and this is their debut album. The sound on display here isn't particularly spellbinding or groundbreaking, but it is enjoyable, and a strong, full production job combined with a snappy, melodic guitar attack and full-speed-ahead double bass drums make Moment of Life slightly above average from what I expected at first, and right from the opening bombast of "At the End of Forever," Eagleheart don't let up, plowing forward with a set of highly entertaining Power Metal crackers that are divided either into the camp of the Fast, Happy and Melodic Speed Killer and the Metal Ballad, as is expected. Eagleheart won't be getting any customer complaints any time soon; they have their job down pat. This is a tad more complex than what you'd think, with more time changes and more intricate melodies than are usual for the genre, but it doesn't quite hit the "Prog" level, not this time. The whole package is pretty much what I would've expected Edguy to release after Vain Glory Opera, with a concise sense of melody and tight, punchy songwriting raising songs like the fantastic "Into the Sky" and the lethal title track straight up to the stratosphere, and with "Don't Turn Your Head" being practically a lost Edguy track in itself, with an extremely catchy chorus and driving melodies. The only drawback is the vocalist, who isn't at all bad, but lacks charisma, possessing a competent but flat and listless voice that I was ready to hate at first - luckily I went back for another listen later and found that he was tolerable and did his job well enough. He sounds pretty good on the ballads, but his voice can't hold up under the pressure of the more challenging, high-octane tracks here, and that is a problem. Musically, though, Eagleheart are very promising, and with a bit of refinement, they could become a force to be reckoned with in the Power Metal world, so we'll have to keep an eye out for them in the future.